Join us in the fight to put an end to Alzheimer's with this Personalized Cure Alzheimers Awareness T-Shirt. This Alzheimer's Awareness T-Shirt shows that you are helping support those battling with this condition, honoring those who have been taken from us and gives hope to all Alzheimer's warriors and their families throughout the world. Each Personalized Alzheimer's Support T-Shirt proudly displays your love, compassion and your never ending support and commitment to finding a cure. Our Alzheimers Awareness Walk T-shirts are a great way to spread awareness. This Personalized Awareness Shirt is available on our preshrunk 100% cotton T-Shirts, machine washable in youth sizes XS-L and adult sizes S-3XL. FREE Personalization is included on the back of each Shirt. 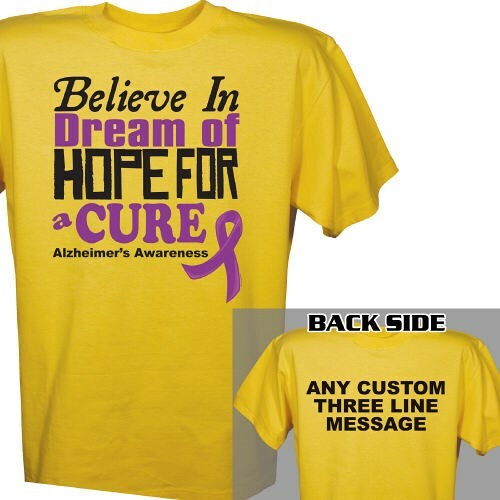 Personalize the back of your Alzheimers Walk Shirts with any three line custom message. Love the shirt .good quality and personalization was spot on! I'll be wearing it this weekend! I searched to find a shirt for my 1 yr old grandson to wear in the walk. i looked through the entire inventory and picked it because it said XS 2-4 youth - it was comparable to other 6-8 shirts we have. he will not be able to use it. Very disappointed. Cute shirt. incorrect size. This really pops on the bright green that I ordered it on. Love it! Bright way to send the message, size accurate..
Additional Info At MyWalkGear.com, we feel strongly that Awareness is the key to finding the cure for Alzheimers or any other known disease. That is why we have created a collection of Personalized Awareness Shirts and Walk Gear for your team and friends to help spread awareness. Awareness educates people about the nature of Alzheimers and its implications to those who have it. Help us help others spread awareness so that one day Alzheimers will be a disease of the past. Be sure to also take a peek at our Believe in a Cure Alzheimers Awareness Key Chain and be sure to bring along our Personalized Believe In A Cure Alzheimers Awareness Water Bottle as well.